The chapel was built in 1807. On April 8th 1822 Rev. David Griffiths, the minister of Glanrhyd, preached by the river Teifi at Cardigan upon the departure of the first local emigrants to Canada aboard the “Albion”. In 1826 Rev. David Griffiths, living at Llantood Farm where he had probably been born, was still the minister and was the subject of malicious and false rumours propagated by David Thomas of Prengast, Llantood. On 8th June 1845 the minister, Rev. David Griffith, died aged 68. On 15th July 1869 the foundation stone of a new chapel was laid about 80 yards from the original chapel. The new chapel was opened on 29th October 1870. Ca1879 Rev. William Morris became the minister. A concert was held here on 13th February 1890. On 6th July 1892 Thomas Jenkins, a faithful elder, died aged 64. In 1896 John Davies became the chapel secretary. On 3rd December 1890 Rev. William Morris, for 20 years the minister, died. A concert/eisteddfod was held here on New Year’s Day 1900. An eisteddfod was held here on 26th March 1902 – Rev. S. Glanedd Bowen was the minister at that time. On 20th January 1907 the chapel reopened following repairs by John James, mason, St. Dogmaels and David Griffiths, painter. Woodwork repairs were carried out by Messrs. W. Thomas & Son. At Whitsun 1908 Rev. Owen Jones, minister of Glanrhyd, died aged 65. In April 1908 Rev. David Richards accepted the call. On 10th February 1909 Rev. David Richards was inducted as the minister here and at Capel Seion, St. Dogmaels. In 1909-21 Rev. David Richards was the minister. On 8th March 1913 William Edwards of Fagwrgoch, a deacon, died. On 13th September 1921 there was a farewell meeting for the departing minister, Rev. David Richards. On 26th June 1923 Rev. D. Moses Davies became the Minister until 1937. On 8th April 1925 William Thomas, the elder here, died aged 65. A vestry was added in 1934, designed by John Teifion J. Williams, architect, of Cardigan. It was opened on 26th December 1934. On 7th December 1937 Rev. D. Moses Davies, the minister, died suddenly aged 61. In May 1940 Rev. H. Jenkin Evans became the Minister of Glanrhyd and Capel Seion, St. Dogmaels and remained so in 1944. In February 1946 John Davies retired after 50 years as the chapel secretary. On 16th May 1958 Rev. Gomer M. Roberts became the minister here and at Capel Seion, St. Dogmaels. In January 1961 John Daniel Davies, a deacon of the chapel, died aged 69. In November 1965 Rev. 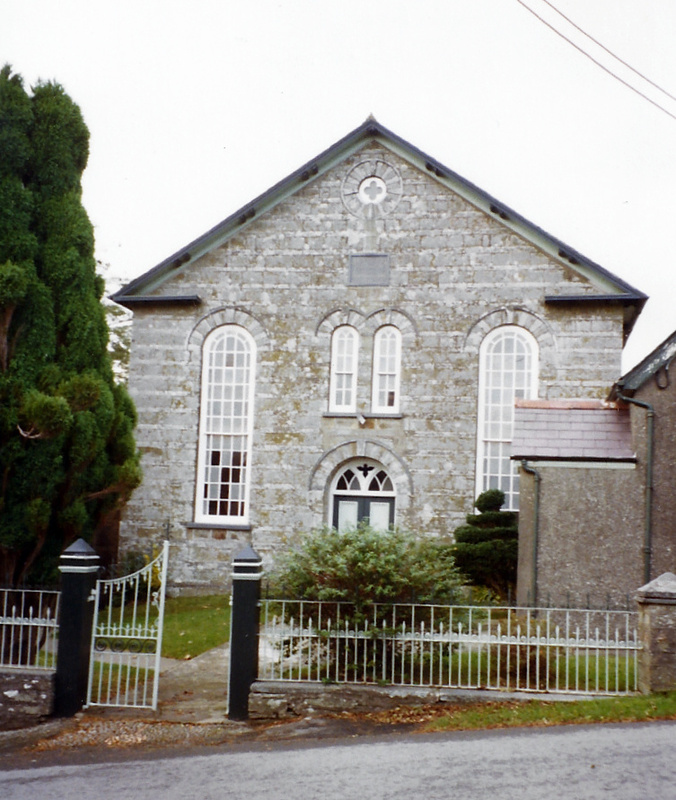 Gomer M. Roberts also became the minister of Babell C. M. Chapel in Cilgerran. On 1st October 1970 a centenary service was held here. In 1979-89 Rev. Idris Lewis was the Minister. The Deacons in 1979 were David Thomas; D. Lloyd Edwards (Treasurer); S. Pugh Jones; J. Griff Lloyd Edwards (Secretary); Donald Lloyd and Harold Davies. In 1979 membership fell from 45 to 44. In 1980 membership rose from 44 to 45 and in 1981 rose from 45 to 48, falling to 47 in 1982, 44 in 1983, 42 in 1984, 41 in 1985 and 39 in 1986. In 1989 Deacon J. Griff Lloyd Edwards died leaving D. Lloyd Edwards, Donald Lloyd and Harold Davies as the Deacons. The chapel became a listed building in 1994. “…EXTERIOR – 1870 Calvinistic Methodist chapel in banded tooled rubble stone with slate roof. Bracketed eaves with open pedimental gable over keyed roundel with quatrefoil and plaque ‘Glanrhyd Adeiladwyd gan y Trefnyddion Calfinaidd 1870’. Three-bay front of arched openings with bicolour voussoirs, keystones and slate outer arch rings. Small paned windows, two long outer windows with marginal glazing bars and radiating bars to heads, two small narrow centre lights with Y-tracery heads and broad doorway with Y-tracery fanlight, the centre panel with Gothic cusping. Paired 2-panel doors. Two storey, two-window sides with 16-pane sashes and two long end windows. Attached to right hand corner is 1934 vestry by J T Williams of Cardigan. INTERIOR – Pitch pine pews, three-sided gallery on 2 by 3 turned wood columns, the bases at pew back level. Gallery front in long horizontal panels. Curved angles. Clock marked Thos Thomas, Cardigan. Pulpit on square platform with steps up each side. Flat ceiling with one small rose. Entrance lobby has window with etched and coloured glass to corner panes. Front railings on low stone wall with stone end piers and painted slate gatepiers. Spearhead rails with dog-bars. Paired gates ramped up to meeting stile. Hi Gaynor. Any additional information is always of interest to me, so I’d be very pleased to take a look at them. Do you need an e-mail address for me?